Well crap. Wednesday's routine vet visit turned non-routine for Tsuki. 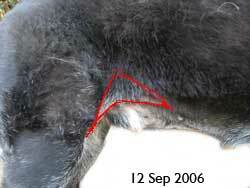 Vet found a lump on the fold of skin between the back leg and abdomen. 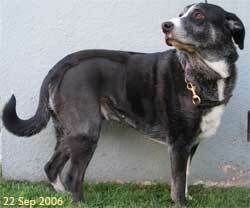 Aspirate showed mast cell tumor - grade 2 or 3. He is there now getting ultra sound and X-rays, and more blood work, and urine analysis (kidney values slightly off). I think I found another (very different in appearance) on his chest. I meet with the oncologist Wednesday. He is only 7 1/2. I'm writing this after picking Tsuki up from the his ultra sound and X-rays. The vet noted and aspirated the other lump I found, so we have to wait for cytology on that one. The X-rays and ultra sound don't show anything troubling. I'll be seeing the same oncologist who took care of Tanith, Dr. Cecile Siedlecki. The specialist who did the ultrasound and read the x-rays advised them to sample his lymph nodes in the affected leg as Dr. Siedlecki would want that done. I'm glad I have choices here. This is all very expensive, but I actually do have the savings. I had considered paying down the house. Now I'm glad I didn't. Many people wouldn't have the ability to cover these costs. Pet insurance is a good idea to help with that issue. So naturally I spent some time look up Mast Cell resources. They are troubling given the tumor grade. The vet today sounded positive "with aggressive treatment" but even if it turns out that way there is a rocky road ahead. They will have to remove a very large area around the tumor. 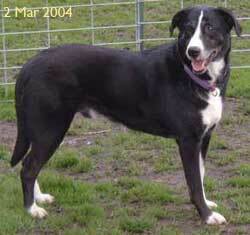 We have a herding lesson Tuesday. That may be his last opportunity to herd. Even in the best case scenario he is going to be on restricted activity for a long time just due to the extent of the surgery. 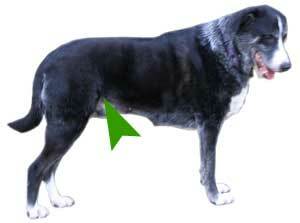 Pet Education: Canine Mast Cell Tumors - easy to understand with some photo illustrations. 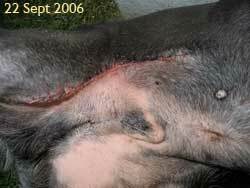 Bernese Mountain Dog Club: Mast Cell Tumors - this site include a detailed explanation of mast cell tumors. It also includes many short descriptions of individual experiences with the cancer. 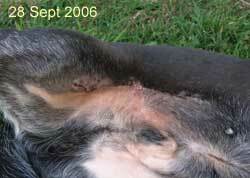 The page Wonder Puppy's Canine Mast Cell Tumor is much like this one, a diary approach. Cancer Diagnosed - very long and very detailed diary of Roxanne's battle with Mast Cell disease. A reminder that the ability to predict outcomes, both good and bad, is very uncertain. Dr. Siedlecki has a manner that does well for me. She is direct, honest, and calm. I never want to assume that the research I've done is correct so I always let my professionals tell me things. In this case one good thing to hear that the actual prognosis for Mast Cell Tumor is better than what is reported in literature (and the internet). She explained that often it is entirely handled by the general practice vet and those tend not to get accounted for in the statistics. Friday evening I had found another small lump on Tsuki's shoulder. This was after two vet techs had inspected him "all over". Missing lumps is surprisingly easy. Anyway I pointed it out during our consult and an aspirate was taken from that one. At the same time they went over him again and found yet another lump around the bottom of the rib cage. It was very subtle, difficult to find unless he is lying on his back. An aspirate was taken from that one as well. Both aspirates showed to be benign. We reviewed the different treatment possibilities, surgery, radiation, chemotherapy as well as supportive care all depending upon the progression of the disease. The steps we had taken so far - X-rays, ultrasound, aspirate from the nearby lymph nodes and blood tests - were all designed to determine whether the cancer had metastasized (spread) into other parts of the body. The last recommended test was of the bone marrow. If we did it right away it and it came back positive (meaning showing the cancer had spread) then surgery would be useless. On the other hand if it came back negative (no evidence of spreading) then he'd need a second anesthesia for the surgery itself. The alternative was to take the marrow during the surgery. That is what I chose to do. I would want to know. But I decided that even if the marrow had come back showing the cancer had spread that it having had the surgery would only be medically useless. For me, well OK I wouldn't do surgery if I was sure it would be useless, but I wouldn't be sorry to have done it - just glad to get rid of that lump. My friends asked me how it went. I had what may have seemed a peculiar type response "Well, I have no worse news." But really that's how it is at this stage. You keep looking and the good news is that you aren't seeing any bad news ... yet. But there is more to go before you can start thinking - OK this is going to be OK. That next step was surgery to remove the lump (and a good deal of the surrounding tissue) and get that bone marrow aspirate. So now I had an appointment with the surgeon. Well the surgeon, Dr. Bennett, was fairly positive, a little less cautionary than the oncologist. Small wonder, he only gets to see the dogs that are reasonable candidates for surgery. He did remind me that although the lump was fairly small that we really can't tell much until it is removed and the margins examined. However, the location of the tumor was probably about as good as it gets. There was a lot of extra skin that could be removed without resulting in impairment. The plan was to remove a circle with a diameter of about 3 inches, plus a taper on either end for a resulting set of stitches about 8 inches long. The removed portion would then be submitted for biopsy. A sample of bone marrow would be taken. Samples of the removed tissue would be examined. If no cancerous cells are found near the margins then it is considered "clean" and that would be good news. One piece of information that I didn't understand from my earlier internet research had to do with depth of tissue removed. Many sites emphasized that the desired margin was about an inch in all directions, including depth. But both the oncologist and the surgeon said that depth would only go to the fascia of the muscle - that is the tougher cover for the muscle. Apparently this cancer doesn't typically penetrate that layer so its a good bet to leave it alone. Tomorrow is surgery, but today we go herding. He enjoyed himself. At this very moment I'm frustrated because they screwed up the surgery schedule. I saw the surgeon on Monday. The surgeon was fairly optimistic given the apparent tumor size and location - the caution being that we don't really know until (a) it is removed and the edges examined and (b) we get the results of bone marrow. So we scheduled him for today (Wednesday). And because I had an 8 am meeting I got there are round 7:30 to drop him off at the but they didn't have any of his paperwork ready. So they had to call over to the other side (the specialty clinic that doesn't really open until 8) and they strolled over with his paperwork. Then I failed to account for commute traffic. Between the 2 I was about 15 minutes late for my meeting. Then at 2 just as I'm about to call to see how the surgery went I get a call from them. Oh, well, gee we kind of forgot to put Tsuki on the schedule and gee we scheduled 3 other surgeries so he'll actually not get his surgery until oh maybe 6. I really don't like Tsuki being surgery number 4. I wish I had the guts to pull him. Anyhow - Tsuki went in feeling fine. That is nice. He got to play herding yesterday. And I haven't gotten any worse news yet so that is a very good. Well they didn't finish the surgery until around 8:30 pm. Everything went fine. I picked him up around noon. They told me they would be shaving a large area, and they were right. Yikes! He looks awfully naked. He is a bit subdued but otherwise appears fine. Tonight he is sleeping more than normal but if I didn't have him leashed he'd have run down the stairs and around the backyard. So hopefully the biopsy will come back with good news and we can just get on with healing. While there aren't any signs of problems the pain control medication is only almost controlling his pain. He has never been a big complainer. He moves fine, in fact trots if I don't slow him down. But when he is resting he gives out an occasional moan or groan. At least he isn't licking or scratching at his stitches. In my experience he will start to get itchy a couple days from now. Fortunately I can work from home so I can supervise him absolutely continuously. I'm telling him he has to sleep on the pad at my feet (usually Freeway is there) instead of his favorite spot in the front room. He seems fine with that. At the moment he is sleeping with his head on my foot. I've been thinking about the experience so far, the expense, and the situation if I didn't have the money. Lots of things are risky. I'm not sorry to be spending the money to uncover everything there is to uncover. BUT I know that at any time in my life money could become a problem. It has happened in the past. So with that in mind, what to do for people in that position. Well, to my mind, that would be surgery to remove the tumor itself if it can possibly be afforded. Next step is to note - if you can't respond to the information, and if money is really a problem - well then information just for the sake of information probably isn't worth while. In other words if a person couldn't afford a second surgery or couldn't afford radiation or chemo if all of the tumor was not removed, then the pathology report doesn't do a whole lot. Keep in mind I am NOT a veterinarian. I'm making an assessment on extremely limited information. And I'm not saying one should skip any part of the diagnostics. I'm just suggesting that taking partial steps may well be enough, and so worth trying. Things seem to be proceeding well enough. So far he isn't fussing with his stitches, or even the shaved area. The hair in the shaved area is growing back noticeably. It hardly seems like only four days have passed. It feels like much longer. Usually the healing area gets itchy and then it gets harder to guard against chewing, licking, scratching without using an "e-collar." By e-collar they mean " Elizabethan collar " or that cone shaped thing that makes the dogs bump into everything. I'd like to get by without it if I can. So far, so good. 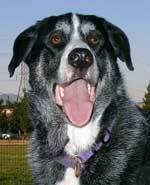 Alternatives include the Bitenot and Soft-E-Collar. 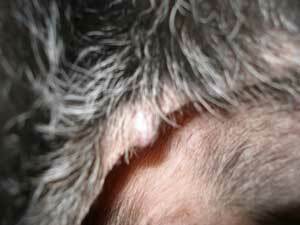 I took some pictures of how Tsuki's hair is growing back. I'm not sure they really do justice. All I can say is that he looks less naked. Finally. I got a call from the surgeon. The margins are clear - and large enough. So we aren't looking at more surgery. I have an appointment with the oncologist next Thursday to recheck and remove the stitches. 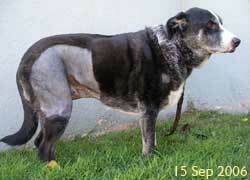 He does have some redness of the incision right at the place it makes the turn from his leg to his body. I think it is just because it gets more stress. Tsuki tends to sleep curled up, or lying on that side so he does put a bit of stress on it. I decided to take Tsuki in and have someone look at the suture line. It didn't look bad but the area with redness was so distinctly different from the rest (which is healing well) that I decided a more experienced eye was needed. I just dropped in, they took a look, agreed that the problem was the location, and said just keep an eye on it. No additional medication required. I took some more pictures to show the progress. Well yesterday's appointment went well enough. Tsuki's sutures were removed. He was pronounced fit to return to norma activity. Essentially we are done with this, for now. Sometimes new lumps form, so any lump needs to be checked ASAP. I also sprung for a rather expensive followup test to evaluate the aggressiveness of the tumor. If it is considered very aggressive then a course of chemo would be recommended. There is about an 80% chance that no further problems will be detected.